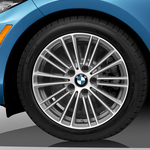 The BMW 2 Series is featured as a popular coupe or convertible. Both editions are equipped with a turbo 3.0-Liter engine, which is also 6 cylinder. Both editions also produce 335 horsepower, which makes both vehicles go from 0-60 in less than 4 seconds. The vehicle comes in a variety of colors, and the interior is filled with the latest and most advanced technologies on the market. The interior of the cars also has navigation right in front of the steering wheel, which makes driving even safer for drivers. The outside of the cars is equipped with LED lights that are automatic and run during the day and night. The LED lights are fixated in a way that they become an extremely gorgeous design on the overall cars. The high beam lights are also LED, and they can be easily accessed at a moment’s notice.